If you use QuickBooks Online to manage your accounting, you'll be happy to know that OwnerRez integrates with QuickBooks. Read about how it all works in our QuickBooks Integration Overview article. This articles covers how to connect QuickBooks to OwnerRez and the settings you can use to make it work. Before connecting, it's important to understand that you must be using QuickBooks Online, not the Desktop or offline versions of QuickBooks. We may support the Desktop/offline versions in the future, but currently our integration only works with the Online version. If you're curious, this is because OwnerRez "talks" directly to the QuickBooks servers over the internet, transmitting booking and payment data. That type of paradigm is not possible if you're offline and using a desktop product. For something like that, we'd have to provide export/import files for you to bring into QuickBooks manually. Modified booking or payment records would not work and there would be conflicts to resolve all the time. The online paradigm is seamless and addresses all of those issues automatically. Also, you must also have an active QuickBooks account without any billing or subscription problems. Our integration will work during the QuickBooks trial period, but if the trial period expires and you haven't configured a QuickBooks subscription, the integration will stop working. Go to Settings > QuickBooks to get started. If you've never turned on the QuickBooks premium feature in OwnerRez, you'll first be asked to do that. QuickBooks Integration is a premium feature, and thus has an extra monthly cost. However you can turn it on, play with it for awhile and turn it off again before being billed. If you need to turn it on, you'll see a couple quick screens that will walk you through that. 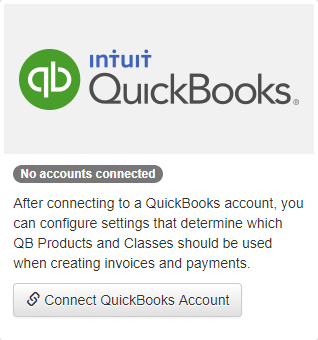 After the QuickBooks Integration premium feature is turned on, you'll see a page showing you a QuickBooks tile and asking you to connect. 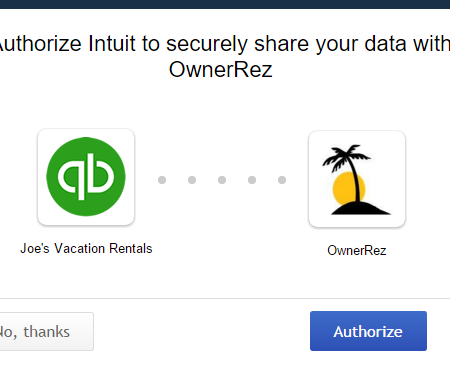 After you click the "Connect" button, you'll be redirected to Intuit's website where it will ask you to login, select your QuickBooks company (if you have more than one) and authorize OwnerRez to do things on your behalf. Click the "Authorize" button and you'll be redirected back to OwnerRez where we'll show you the authorized connection and present you with a page where you can map your charge line items, taxes and properties. Read the following section for an explanation of these settings. We host a special settings page for each QuickBooks Account that you connect to OwnerRez. The settings page tell us how you want your OwnerRez booking data inserted into QuickBooks and which QuickBooks accounts, products, classes and so on we should use. The settings page is long, and has lots of sections, but it's not difficult to understand once you figure out what it's getting out. Take a look. Ask yourself "if I were creating an invoice in QuickBooks from an OwnerRez booking, what would booking fields would I use to fill in the invoice fields"? Think about that as you look at the settings page and that will help you understand what OwnerRez needs to know in order to create invoices correctly. Shows the Company File and Email Address that is currently connected to OwnerRez. This is retrieved from your QuickBooks accounts. QuickBooks requires a "Product Or Service" item on each line of an invoice. In OwnerRez, we group all non-income charges into one of two types: rent or surcharges. Select which QuickBooks item corresponds with each OwnerRez charge type. The list of items was found in your connected QuickBooks account and can be refreshed using the button at the top of the settings page. NOTE: You cannot select Categories in the Property Or Service drop-down. QuickBooks recently introduced the "Categories" entity which are added to our Products Or Service drop-down list. If you select those Category types, the integration will fail down stream. You can tell what is a Category and what is a regular Product Or Service by opening the list in QuickBooks and seeing how the list is grouped. When payments are recorded in QuickBooks, we can map them to a specific asset (ie. bank) account. The list of asset accounts was found in your connected QuickBooks account and can be refreshed using the button at the top of the settings page. Please note that QuickBooks payments can only be deposited to 'Bank' or 'Other Current Asset' type asset accounts. When tax line items are added to the QuickBooks invoice, we can map them all to the same "Product Or Service" item in QuickBooks or we can map a different one per type of tax. At the moment, we do not support the "Sales Tax" wizard in QuickBooks. 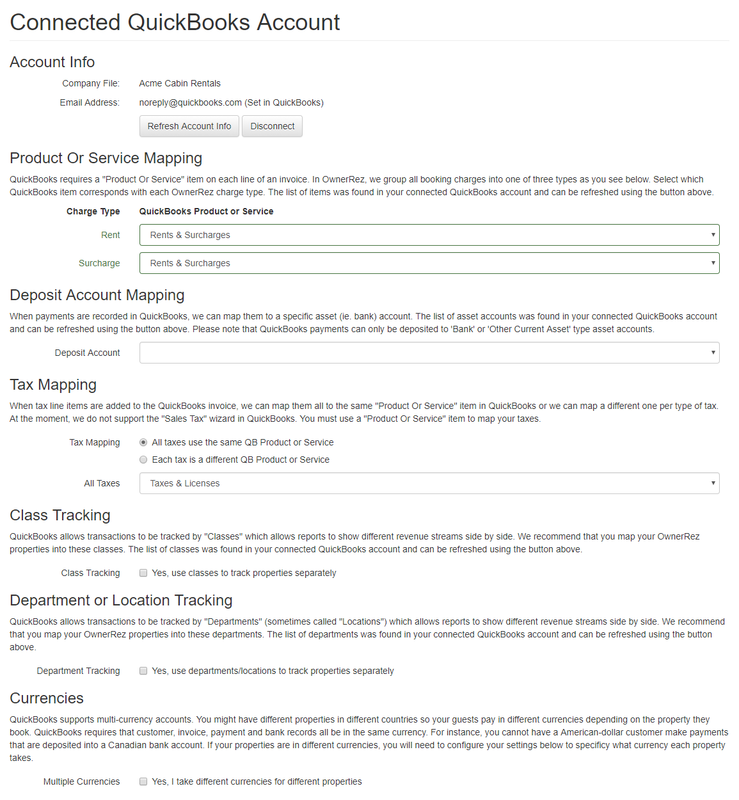 You must use a "Product Or Service" item to map your taxes. QuickBooks allows transactions to be tracked by "Classes" which allows reports to show different revenue streams side by side. We recommend that you map your OwnerRez properties into these classes. The list of classes was found in your connected QuickBooks account and can be refreshed using the button at the top of the settings page. QuickBooks allows transactions to be tracked by "Departments" (sometimes called "Locations") which allows reports to show different revenue streams side by side. We recommend that you map your OwnerRez properties into these departments. The list of departments we provide was found in your connected QuickBooks account and can be refreshed using the button at the top of the settings page. QuickBooks supports multi-currency accounts. You might have different properties in different countries so your guests pay in different currencies depending on the property they book. QuickBooks requires that customer, invoice, payment and bank records all be in the same currency. For instance, you cannot have a American-dollar customer make payments that are deposited into a Canadian bank account. If your properties are in different currencies, you will need to configure your settings to specificy what currency each property takes. In addition to the above settings, you can also specify which properties in OwnerRez you want the QuickBooks Integration to run for. This allows you to sync different properties with different QuickBooks accounts which is necessary if you're a property manager working with different owners and need to send financial data to different company files.